Look through the current shelves and back issue bins at your comic stores, and you will likely find the work of Ivan Brandon. 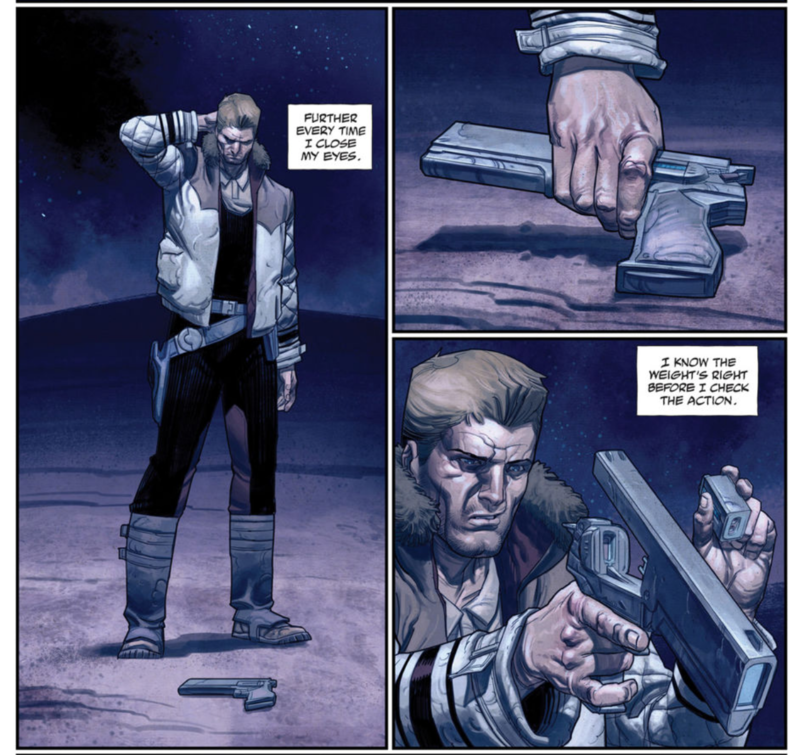 Ivan Brandon is a modern comic book writer, and editor; now working on Drifter, a sci-fi western fantasy published by Image Comics. Born in New York City from Cuban immigrants, Brandon drew his inspiration from comic books since the early 1980s, mainly from Marvel and the works of Bill Sienkiewicz and Frank Miller. Since the early 2000’s he has written and edited for Marvel, DC, Image and more publishers on many titles, working with a variety of veteran comic artists including but not limited to: Michael Avon Oeming (The Cross Bronx), Andy Macdonald (NYC Mech), Nic Klein (Drifter, Viking),, Rafael Albuquerque (Wolverine), Mike Hawthorne (Ruule: Ganglords of Chinatown), Tom Derenick (Men of War). Hello Ivan, thank you for joining us. It’s been a helluva Comic Con (Sunday, the last of the four-day event). Are there any fresh announcements or coming books you would like to share with our readers? Ivan Brandon: There has been nothing new since Image Expo,where we announced the two books there. 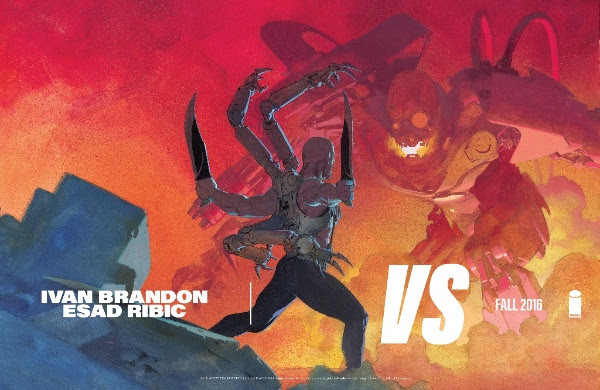 One is VS, which is done by myself and Esad Ribic. The other book is Black Cloud, which is done by myself, Jason Latour, Greg Hinkle. And for those not quite caught up, could you give us a short blurb on each? Ivan Brandon: Yes. Basically, VS is a sci-fi story set in a future where war has been privatized and is an organized spectator sport where different factions fight publicly in a sort of gladiator combat. We follow one character through one of his victories, and more importantly, some of his failures. 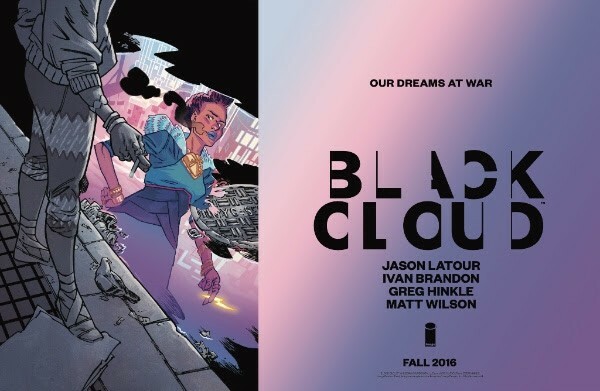 Black Cloud is about a world and past where reality was composed by storytellers by the will of the individuals. Their ability to define their space to believe in the world and basically dealing with a character who rebels and is exiled from that world and then stuck in New York City, and then struggles to get back to where she is from. You have some interesting and varied styles with much of your writings. For either of these books, were there any new research or interesting preparations you looked into? Ivan Brandon: Yeah, there is a lot of there and some of is hard to explain because of spoilers. I am to a fault..tend to paint myself into a corner of having to reinvent how I approach a story, every single time I do a new book..so it’s no different with these, as they are both different from anything I have done and different from each other. VS did involve me reading elaborate textbooks how the brain is composed, how it works for example. I ended up doing a ridiculous amount of research. Even when I was working the old days back at Marvel, I did a forty page story but read a 500-page story to plan for it. It’s not so much the data, but just getting myself in the mindset to jump into the story, and for the creative angle that’s interesting. Drifter, of which I am a big fan of its unique style and storytelling. Something that has been a bit of a mystery to me..the time and setting. Could you elaborate a bit more on the large world, time and place of that, or is that meant to be a bit of a secret your withholding? Ivan Brandon: I can say a bit of this. We are just about to finish the 13th issue, which comes out next week (note: interview was done in late July), which is the penultimate issue of that the 3rd arc. There are some answers coming out, with definitely some major moves and answers on the difference factions of the world, and how they interact with each other. There will be a big reveal at the end of this arc. And then the next arc, there will be wall-to-wall reveals. One thing I will say is that I don’t want to reveal too much and that not everyone’s checklist will be met. But, it is my intent to for my own understanding of the story is that all my questions that I think I have posed will have very clear and specific answers . Not only will they be answered, but they will be in such a way more going back to the beginning of the story, that you will see that to a degree they have been answered, but just subtle. Yes, I had a feeling that some pieces would come together, while I continue to enjoy the series with its awesome colors, art, and concepts. Looking back on Marvel and DC, where your world-building can only go so far, and then seeing how your creative work you has no boundaries, which can be an inspiration to new writers looking to build their own worlds. Do you have good advice on creating from scratch toward a believable setting? Ivan Brandon: Yeah, it’s a balance where believability is key. You can make almost anything believable if you approach it the right way if you’re honest about it. I can’t say there’s a correct right or wrong way of doing that, but for me, it’s trying to sort of brown things in. Sci-fi is a great example, where people can get a little too obsessed with a lot of bells and whistles that make up sci-fi. For me, if you can create recognizable characters that can anchor the reader into some sort of something they are familiar with, from their own experiences and own emotions, or whatever. Then, you can build any sort of environment around it that you can believe, then you learn from that and appreciate that world through the characters eyes. Then, what I try to do is focus and find the humanity in the character in whatever period it is, like in my Viking story before Drifter. Different as that story might be, there are very classic desires that any kind of human has in any time period, with specific desires and emotions, I can hopefully connect with those things and then I can take the reader along to. That’s great. And you have worked with so many artists. For those also new in creating comics, do have any advice for those in picking out their artists? Ivan Brandon: I think you want to work with the most exciting, most talented person you can because that’s the person ultimately telling your story to the world. They are the ultimate performer of the story, right? When the person is flipping through the book or walking past the stands..it’s that cover that I didn’t draw. That person is singing the song. You also want someone that has a great range in what they can express. 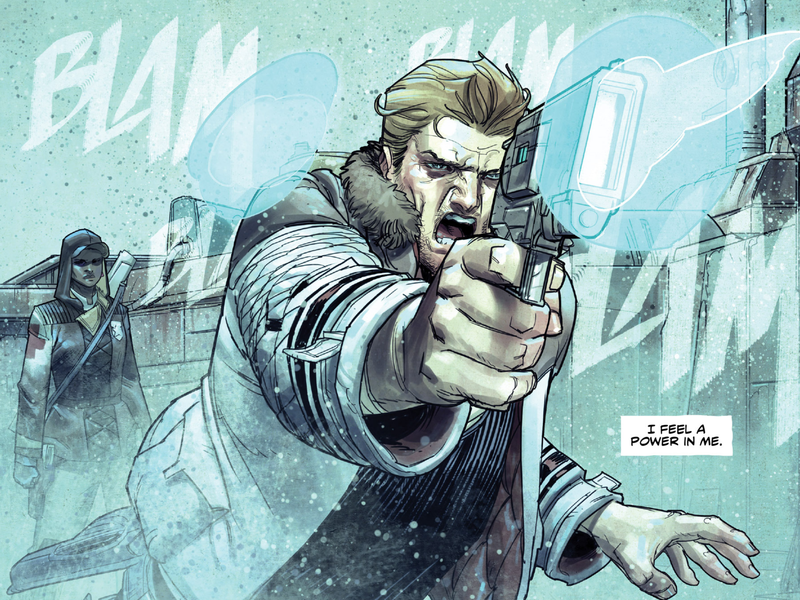 To me, comics are a very really interesting place that you can do the freedom to present visually almost anything. You have to balance the excitement of almost gratuitously create the most exciting the most exciting visual spectacle that you can, with believability. To me, finding someone who can believably put real human characters into them. And, by human, I mean in quotes because it can be a story about an alien or whatever. But you still want to find that humanity, that heart that you can connect with. That to me, is one of the most important things what you need, to find someone who can handle that “acting” of the characters in a convincing way then that’s half the job right there. The audience than can fall in love with those characters, then it doesn’t matter where you take those characters, they will follow you..that is if you do that job right which is easier said done. So, to wrap it up do you have any last-minute words to your fans and potential fans out there reading this? Ivan Brandon: Thank you everybody. I’m really excited to bring the new books out, and I hope you dig them. Drifter monthly issues, the Volume 1 and 2 collected volume paperbacks , and other works of Ivan Brandon are available everywhere at awesome comic stores and better book retailers. Digital back issues are available via all current digital outlets carrying Image titles. For more info on Ivan Brandon and his work, visit his official site at ivanbrandon.com and follow him on Twitter at @ivanbrandon. – Interview by Orion Tippens (Orion T) – eic, frequent writer of the Stranger Worlds,explorer of all science fiction across all planes and platforms.